Brussel Sprout Quinoa Casserole Salad | Eat Live to Thrive! Growing up, when I was made to eat a little of everything on my plate, the one vegetable that I feared most was Brussel Sprouts. It didn’t matter how I tried to imagine them as something else, dress them up with spices, gravy, or even pancake syrup, they were my veggie nemesis. It was not until my teen years that I acquired a taste for them, but once I did, I couldn’t get enough of them (much to the disappointment of my two german shepherds that I often fed them to). Here is a Vegan recipe for brussel sprouts for an awesome, high protein, high GOOD carb and good fats meal that is high in Vitamin K (a vitamin that most people are deficient in). 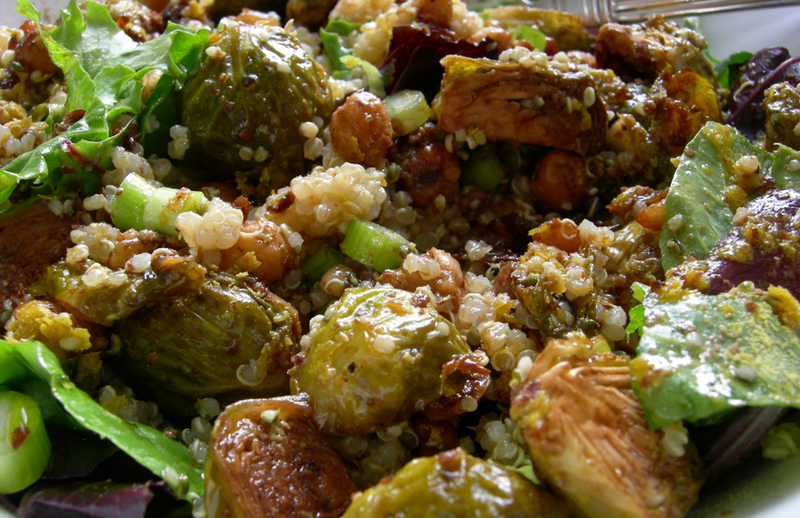 Mix cooked quinoa, brussel sprouts, dates, and walnuts together and set aside. This mixture should be slightly warm, but not room temperature. Lightly saute all other ingredients except spinach in coconut oil on medium low heat for three minutes, stirring in the cabbage and spices last (except salt) and heating for another two minutes. The matrix is done when the cabbage is fully heated, but NOT soft/soggy. Once ingredients have been lightly sauteed, pour them over the cooked quinoa, brussel sprouts, dates, and walnuts and mix together well. Add raw spinach at end and lightly mix in to combined matrix. Serve immediately with brown rice and tossed salad.